What is underpinning? Foundation underpinning is the process of strengthening and stabilizing a settling foundation of an existing structure. In order to achieve this with the underpinning method, galvanized steel shafts, also know as helical piers or screw piles, are inserted into the ground until they hit supportive soil stratum. 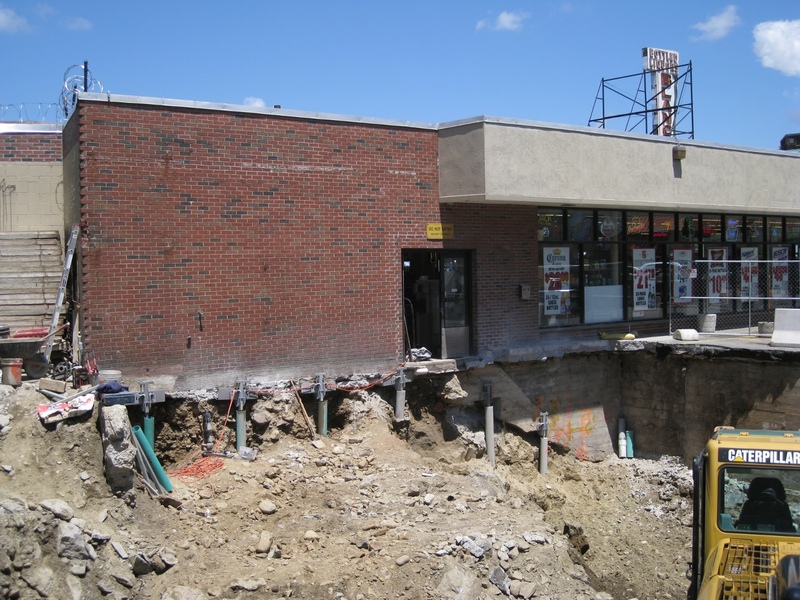 These piers allow the foundation load to be transferred to stable soil. As a result, this deep foundation system helps to level the structure. AB Chance Helical Pile Foundation Systems are an alternative to micropiles as a common method in underpinning. The soil surrounding the foundation may have changed over time. The construction of nearby structures may require the excavation of soil supporting the existing foundation. It is more economical to fix the present structure's foundation than to build a new one. Please fill out our form to contact one of our helical pile installation specialists to give you more details on structural underpinning for sinking foundations.